well as tunability of their optical and electronic properties through chemical modifications. Since the first report of electroluminescence from PPV, a great research attention has been focused on these types conjugated polymers (Burroughes et al., 1990). This focus was moreover up heaved after the discovery of an ultrafast photoinduced charge transfer from alkoxy-substituted PPV to the buckminsterfullerene (Sariciftci et al., 1992). 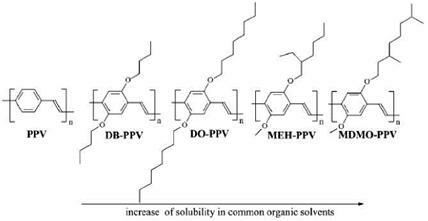 PPV and its derivatives remain the most popular conjugated polymers for this application and continue to generate considerable interest and much research for photovoltaic applications (Cheng et al., 2009). The pure PPV is insoluble, intractable, and infusible and therefore difficult to process. Solution processability is desirable as it allows polymeric materials to be solution cast as thin films for various applications. A general methodology to overcome this problem is to develop a synthetic route that involves a solution-processable polymer precursor. First synthetic route for high quality PPV films with high molecular weights was first introduced by Wessling (Figure 5) allowed the synthesis of soluble precursors, which can be processed into thin films prior to thermal conversion to PPV (Wessling & Zimmerman, 1968; Wessling, 1985). A potential drawback of the precursor routes is the limited control over poly – dispersity and molecular weight of the resulting polymer. (Figure 7). This route involves mild polymerization conditions, and the molecular weights of the polymers obtained are generally high (Cheng et al., 2009). Solution-processable PPV derivatives were first reported by Wudl et al. (Wudl et al., 1991; Braun & Heeger, 1991) and by Ohnishi et al. (Doi et al., 1993). The solubility of the materials was achieved by grafting of long alkoxy chains, which cause some conformational mobility of the polymers. Consequently the soluble derivatives have lower glass transition temperatures than pure PPV. Poly[(2,5-dialkoxy-1,4-phenylene)-vinylene]s including long alkoxy side chains are soluble in common organic solvents such as chloroform, toluene, chlorobenzene, dichloromethane, tetrahydrofuran. Fig. 8 shows the chemical structures of PPV and its various alkoxy-substituted derivatives. The solubility increases from left to right, whereby the solubility of the much studied MEH-PPV and MDMO-PPV is enhanced by the branched nature of their side chains (Braun & Heeger, 1991). PPV derivatives are predominantly hole conducting materials with high-lying LUMO (lowest unoccupied molecular orbital) levels. The unbalanced charge carrier transport properties and the relatively high barrier for electron injection from electrode metals such as aluminium limit the efficiency of the photovoltaic devices. Several approaches have been explored to improve the electron affinity of PPVs. The insertion of weak electron-withdrawing triple bonds (—C=C—) within the PPV backbone can be regarded as one of the most original approach of enhancing the electron affinity of PPVs Brizius et al., 2000; Egbe et al., 2001). The substituent on the phenylene ring of PPV allows for the tuning of the band gap. Enhanced electron affinity of substituted PPVs is reflected by higher absorption coefficients, lower-lying HOMO (highest occupied molecular orbital) levels, and higher open circuit voltages from fabricated organic solar cells. The HOMO and LUMO levels of unsubstituted PPV are reported to be ca. -5.1 and -2.7 eV, respectively, with a band gap around 2.4 eV. Introducing two alkoxy groups into the phenylene ring to perturb the molecular orbitals lowers the LUMO to -2.9 eV with an essentially unchanged HOMO level. Hence, the band gap is reduced to 2.2 eV (Alam & Jenekhe, 2002). As a consequence, PPV emits a green-yellow light, while MEH-PPV exhibits a yellow-orange emission. Because PPV derivatives are the earliest conjugated polymers developed for organic electronics application, they were also frequently used as the active materials in organic bilayer solar cells before the concept of bulk heterojunction configuration was widely accepted. For organic bilayer solar cells, PPV and MEH-PPV serve as the electron donor in conjunction with a poly(benzimidazobenzophenanthroline ladder) (BBL, P4) as the electron acceptor (Figure 9). The photovoltaic parameters of the bilayer device with the configuration ITO/PPV/P4/ Al showed a Jsc of 2.3 mA/cm2, a Voc of 1.06 V, an FF of 47%, and power conversion efficiency (PCE) value of 1.4%. In case of using MEH-PPV as the electron donor, the device reached a PCE of 0.8% under the same conditions (Alam & Jenekhe, 2004). The better photovoltaic performance of PPV over MEH-PPV can be accredited to the greater crystallinity and structural order of the PPV main chain compared to alkylated MEH-PPV. Soluble MEH-PPV was also combined with PCBM for organic solar cell applications. The organic bilayer solar cell with the configuration ITO/PEDOT:PSS/MEH-PPV/PCBM/Al showed a Jsc of 2.1 mA/cm2, a Voc of 0.75 V, an FF of 23%, and a PCE value of 0.46% (Zhang et al., 2002). An organic bulk heterojunction solar cell including MEH-PPV/PCBM as the photoactive layer showed better PCE values in the range 1.1-1.3% than bilayer solar cells. Furthermore, by stacking two independent single organic solar cells together with the help of the transparent cathode LiF/ Al/ Au, the PCE of the multiple-device stacked structure can be dramatically improved to 2.6% (Shrotriya et al., 2006). The devices can be stacked together and connected either in parallel or in series, resulting in doubled Jsc or Voc, respectively, compared to those of a single device (Cheng et al., 2009). Two alternative soluble methanofullerene derivatives P5 and P6 have been developed to serve as electron acceptors and combined with MEH-PPV to produce organic solar cells. The chemical structures of the C60 derivatives are shown in Figure 10. Due to a better compatibility of P5 with MEH-PPV, the MEH-PPV/P5 system shows a better device PCE of 0.49% than the MEH-PPV/P6 system, which has a PCE of 0.22% (Li et al., 2002). In addition to C60 derivatives, different types of titanium oxide (TiO2) were blended with MEH-PPV for photovoltaic device applications (Breeze et al., 2001; Song et al., 2005; Wei et al., 2006; Neyshtadt et al., 2008; Shim et al., 2008). However, their device performances were generally low, with PCE values lower than 0.5% (Cheng et al., 2009). In organic bulk heterojunction solar cells, MDMO-PPV is the most widely used PPV derivative to serve as the electron donor in combination with C60 electron acceptor derivatives. Organic solar cells based on combined MDMO-PPV:PCBM (1:4, w/w) were fabricated by Shaheen and co-workers (Shaheen et al., 2001). It was found that when chlorobenzene was used as the casting solvent instead of toluene to deposit the active layer, an optimal morphology with suppressed phase segregation and enhanced microstructure was obtained, resulting in increased charge carrier mobility for both holes and electrons in the active layer. And this device achieved a Jsc of 5.23 mA/ cm2, a Voc of 0.82 V, and a high PCE of 2.5% (Shaheen et al., 2001). Regioregularity in MDMO-PPV also plays an important role in determining the photovoltaic device performance. A fully regioregular MDMO-PPV (P7) by the Wittig-Hornor reaction of a single monomer comprised of aldehyde and phosphonate functionalities was synthesized (Tajima et al., 2008). Regiorandom MDMO-PPV (P8), from dialdehyde and diphosphnate monomers, was also prepared for comparison (Figure 11). The device achieved a PCE of 3.1%, a Jsc of 6.2 mA/cm2, a Voc of 0.71 V, and an FF of 70% with regioregular MDMO-PPV (P7). This is the highest efficiency reported for the PPV:PCBM system so far. But the device based on regiorandom MDMO-PPV (P8)/PCBM only achieved a PCE of 1.7%. It is concluded that higher crystallinity of the polymer for higher hole mobility and better mixing morphology between the polymer and PCBM contribute to the improvement of photovoltaic device performance with regioregular MDMO-PPV (Cheng et al., 2009). Miscellaneous physics and engineering aspects have been investigated for devices based on the MDMO-PPV/PCBM bulk heterojunction active layer system: photooxidation (Pacios et al., 2006), stacked cells (Kawano et al., 2006), active layer thickness (Lenes et al., 2006), NMR morphology studies (Mens et al., 2008), and insertion of a hole-transporting layer between PEDOT and the active layer (Park et al., 2007). Besides the PCBM organic acceptor, inorganic electron acceptors (van Hal et al., 2003; Beek et al., 2005; Boucle et al., 2007; Sun et al., 2003) such as metal oxides or quantum dots are also under active development and have been combined with MDMO-PPV to prepare hybrid (organic-inorganic) bulk heterojunction solar cells. Optimized photovoltaic devices using blends of MDMO-PPV:ZnO (Beek et al., 2005) or MDMO-PPV:cadmium selenide (Sun et al., 2003) showed moderate PCE values of 1.6% and 1.8%, respectively.